Hi :), I first started with vampires and its a load of fun. not a bad vampire deck to start, although I have a couple suggestions that I hope may be able to help out. The first suggestion I have is a card called Radiant Destiny which is very useful if your going the full on vampire creature route. 4x Radiants would be very well what you need to help those vampires to become stronger. My biggest concern is your mana curve, capping at 5 being the most is similar to the opposite of what vampires are kinda meant to be. Quick and deadly. Thats about all i can think of. I don't think it completely adds up to 60 cards but slightly more but vampires do not need lots of lands because they-re generally fast but around 20-22 lands should work hopefully. 24 is best to if you can find stuff to take out extra. Hey, saw that you're looking for help. 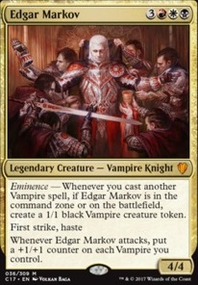 In my opinion the Vampiric Bloodlust precon doesn't showcase Edgar's best ability which is eminence from the Command Zone. You want to take advantage of this with low mana cost Vampires, mostly one/two/three drops. 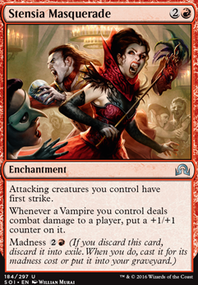 With eminence you want to swarm the board fast with Vampires because each low mana cost Vamp you cast gives you 1/1 Vamp token. Eminence lets you establish an army of Vamps much faster if you're casting one and two drop Vamps. I'm suggesting for you to consider completely changing the strategy of your deck? Reduce the avg. CMC which is currently high at 3.7, make it so you can play a lot more Vamps faster. Use Sanctum Seeker , Malakir Bloodwitch and Edgar as the top end Vampires and cut most of the rest. These three benefit a lot, can do a ton of damage with big armies of Vamps. For upgrades to the precon consider starting by add all the good one drop and two drop budget Vamps? Shadow Alley Denizen : eminence Vamp tokens are black. Mirror Entity : is a Vampire. Can add all these cards for about $11. Can add all these lands for about $17. Can add the rest of these cards for about $12. Total price of suggested upgrades is about $40. If you like these suggestions, or have any questions I offer more advice. Consider Fleshbag Marauder , Plaguecrafter , Merciless Executioner as they have synergy with your commander. 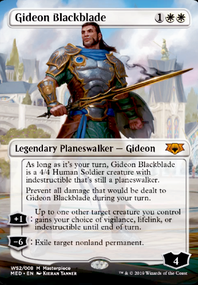 Some additional ideas are Skirsdag High Priest , Brimaz, King of Oreskos , Hangarback Walker , Hero of Bladehold and Mavren Fein, Dusk Apostle for token generators. 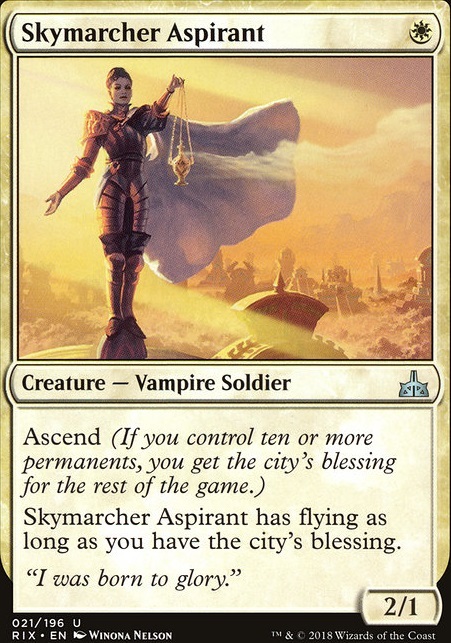 If you plan on keeping a 1 mana drop like Skymarcher Aspirant replace it with Serra Ascendant instead. I highly recommend adding four more land to your deck as you are not a low cmc elf deck with lots of mana generation creatures in the ranks. 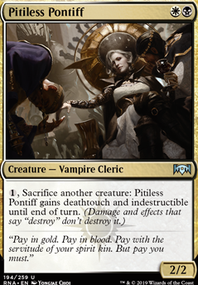 Hey, this is a good start, but consider being even more aggressive with Vamps and eminence? One drop Vamps are pretty important to the strategy with eminence, but the manabase here can't support them very well. Consider more lands that can ETB untapped turn one especially to make black mana for Vamps? Consider more one drop Vamps? Consider more two drop Vamps? Zulaport Cutthroat : not a Vamp, but very good when Vamp tokens are dieing. Sanctum Seeker and Brutal Hordechief : add to the aggression give a lot of opponent life lose reach with attacking Vamps. Shared Animosity : very powerful anthem effect with attacking tokens. Dark Prophecy : triggers when tokens die. Boros Charm : protection from most board wipes. Price of Progress : great burn in Commander, gives a lot of damage reach for two mana. If you like some of these suggestions then I can help you to make cuts.